I think I’ve mentioned before how Cat used to wake me most mornings by lying beside me and purring into my ear, then stretching out for a cuddle before leading me to his brush. In contrast, Not Cat seems to be modelling his morning behaviour on Cato, Inspector Clouseau’s servant. He sleeps quietly for half the night, and then gets up to play. Around five in the morning, he sees any movement, especially of feet, as an invitation to pounce. As soon as I show any sign of getting out of bed he rugby tackles me, and wants a full on game of wrestling. Fortunately he’s very gentle and only play bites, but it’s a bit disconcerting. He’s completely over his front door phobia, and loves to play on the stairs, though he retreats growling to the top landing if anyone lower down opens or shuts their front door. In the garden he’s had a stuck-in-the-tree incident, is finding all Cat’s old favourite places, and is increasingly confident. He’s also met three of the local moggies. He’s chased two of them. The third snuck up on him and made him jump, so I made play with the waterspray. I included this in the post about Bengal spots, but I think that only Sophie and I have been on that one, and I shouldn’t like anyone to miss out on seeing how pretty Not Cat is becoming. Or how relaxed. When I get back from Mother’s I am always in several minds; relief to be home and guilt at leaving her make uncomfortable partners. I also need to reflect on how things have been, as when I am there I seldom have much opportunity. It wasn’t great timing coming home on Friday afternoon. For starters it was very hot and I had left Not Cat’s pillow that I can chill in the freezer in London. He had the ice blocks for my food instead, wrapped in towel underneath the shredded paper in his pet caddy. Probably a bit bumpy, but I didn’t want him overheating. That happened to Cat once on the relatively short journey to the cattery and it was very frightening. My rhubarb survived without its cold companion. The mushrooms looked decidedly sorry for them selves and the hummus fizzed. But the main reason I felt bad leaving was because of Mother. When I arrived on Tuesday I saw her foot was swollen. I asked the carers about it. Neither knew how long it had been swollen. A District Nurse had been in the morning to do the dressing on her heel (it’s the same foot) and not said anything. I asked the carers to make a note so that the DN would look at it when she came on Thursday as I was likely to be already away on the boat, chugging along to the pump out, a journey that was more than necessary. But I’ll spare you the details. A week ago, after a discussion with the GP, Mother’s nightly dose of Mirtazapine was halved. She had been sleeping late in the morning and very drowsy. On Monday night she was very unsettled and the carers blamed the reduced dose. They asked me repeatedly what I was going to do. In turn, I repeated what the GP had advised; we needed to wait at least a week to see how it panned out. This response was met with pursed lips and shaking heads. On Tuesday night, Mother went to sleep in seconds. She had been delighted to see Not Cat. I don’t think she realises he’s mine, but she knows he’s not Cat, and points at him excitedly with lots of “Look, darling! Look! A little dog!” When he goes up to her and rubs her hand she beams. Just watching him soothes her More than ever I feel that there should be animals in every facility for the elderly. In fact one of the best ideas I’ve come up with is for a care home combined with a donkey sanctuary. In the hospital where Mother has had her three incarcerations this year, even PAT dogs are not allowed. The reason is Health and Safety, yet I know my mother’s health is improved by the presence of animals. Not Cat has had two sessions in the garden today. Both involved racing up trees. Like Cat, he loves the cherry tree and returned to it several times. Also like Cat, he found racing up the birch tree much easier than getting down, but unlike Cat, he was prepared to voice his distress, rather than doing the macho thing and pretending he wanted to be there until eventually descending in a less than elegant rush. 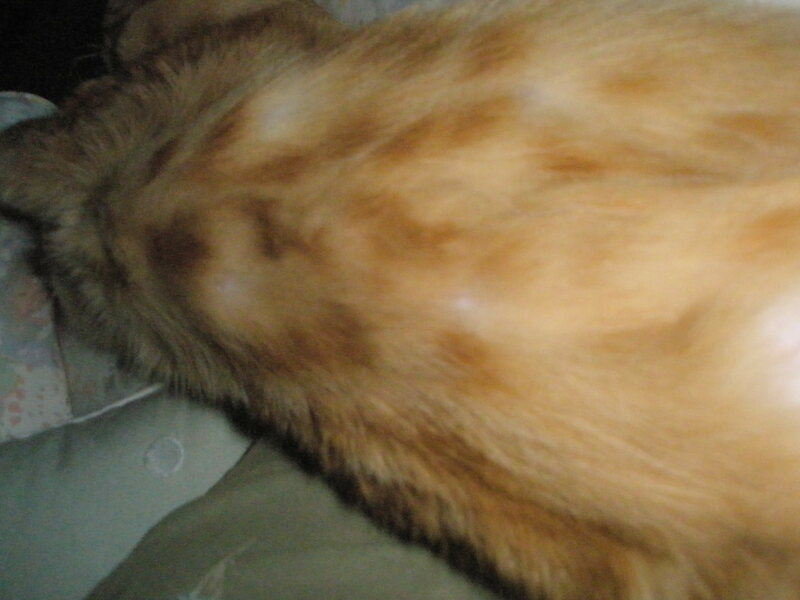 Ever since Sophie asked about Not Cat’s tummy, asking if it were spotted and might he have a touch of the Bengal in his make up i’ve been wondering. He’s semi=longhaired. so his tummy looked to me like broken lines. Oh hang on there a second, could that mean spots? I just tried using the Flip software for the first time. There must be more precise ways of editing, but i’ll have to work at that. It’s so easy to see what Not Cat would have been like as a young kitten. After his successful ventures into the garden at Mother’s flat, I deemed it only right that Not Cat should find out more about our garden at home. Accordingly, when we got back on Friday, I encouraged him out of his travel caddy to have a look around. He wasn’t sure at first, but when I popped him back in the caddy, he had second thoughts, deciding he did want to investigate these surroundings. So he had about fifteen minutes. He was a bit overawed, and took refuge under a car, miaowing at me when I approached, and pretty grateful to be lifted up. I tried him outside again yesterday and he had a ball. 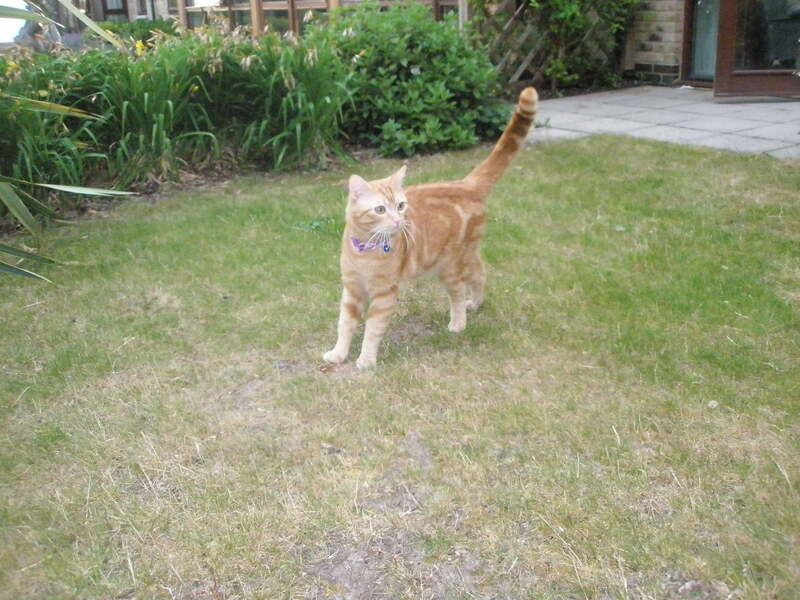 One of my neighbours joined us and he walked up to her with absolute confidence, tail held high. His nose was working overtime. I was really pleased to see him dig a hole, but it came to nothing. At Mother’s he was coming inside to use the litter tray. I think he may have had a poo in the denser part of the undergrowth back here in London. Either that or he’s a bit constipated. He was out again earlier, but this little film is from yesterday. It’s a beautiful morning. The sun is shining; the birds are singing; Not Cat tried to kill a Daddy Longlegs but it escaped him; I’ve had breakfast; washed out the fridge; folded the clean laundry that I left to dry last night; topped up the engine oil; and now I’m just waiting for tonight’s agency to call me. 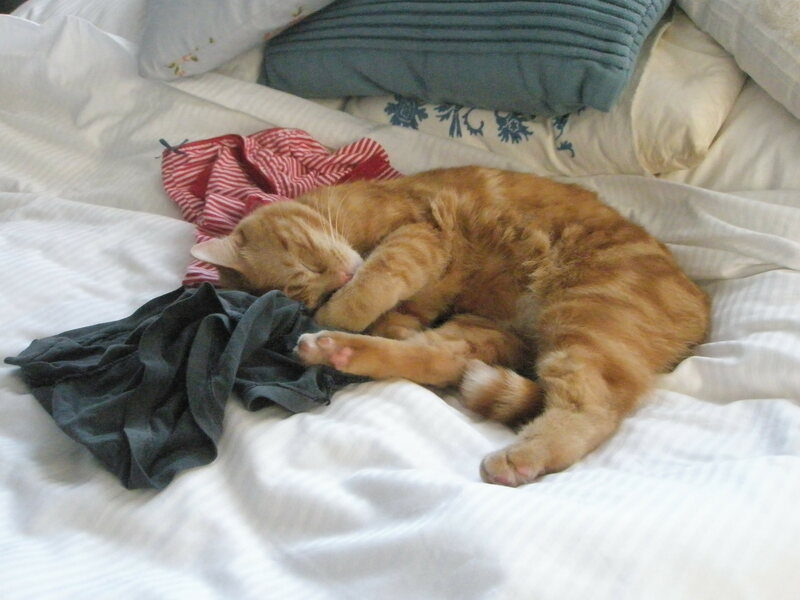 Then I’m going to take my cup of coffee, the laptop, and maybe Mother’s new trousers which I am hemming, and join Not Cat in the garden for a while. Mother has had her morning meds and gone straight back to sleep. The carer didn’t want to wake her, but I insisted she needed them especially the pain killer so that it would have time to take effect before anyone comes back to help her wash and dress. I also asked that when mother has a cold drink it’s in a glass. Some of the carers use the china mugs for both hot and cold drinks. By using mugs for hot drinks and glasses for cold, Mother gets a clear signal about the temperature of what she’s being offered. It’s not rocket science, but it does make a significant difference. At nine o’clock last night, I was sitting in semi-darkness in Mother’s living room, grateful for the sound of a busy bell as Not Cat cantered briefly back through the door for a rest in his explorations. Mother came home at four yesterday afternoon. On Monday, when I called the ward, I was told transport had been booked for the morning and to expect her between nine and midday. So I drove up in the evening, calling the AA out after the first third of the journey when the car behaved oddly. At half past twelve yesterday, wondering if I should be putting lunch on, I called the ward again to find out what time Mother had left. Transport, I was told, had been booked for the afternoon and she could be home anytime between one thirty and nine in the evening. So I could have gone to get petrol in the morning after all. And slept a little later. Or even driven up yesterday morning and enjoyed Monday night in my own bed. I know the hospital staff are stretched, but they don’t have a monopoly on being busy and having to juggle demands. Sometimes I find them quite cavalier in their attitudes. Anyway, the important thing is Mother is home. She looks frail and is certainly disorientated. But she recognised her flat, and the moment the ambulance crew had left, up she got to go to the loo. I went with her, guessing correctly she’d be wearing some form of incontinence pad that she would first struggle with and then discard.